“We are on the threshold of a gigantic revolution, based on the commercialization of the wireless transmission of power. 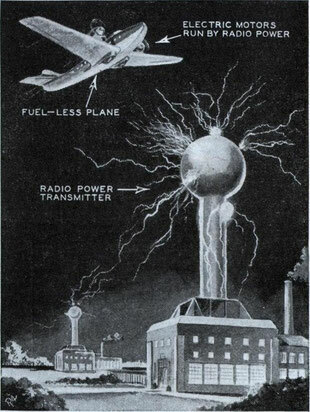 “The same energy (wireless transmission of power) will drive airplanes and dirigibles from one central base. 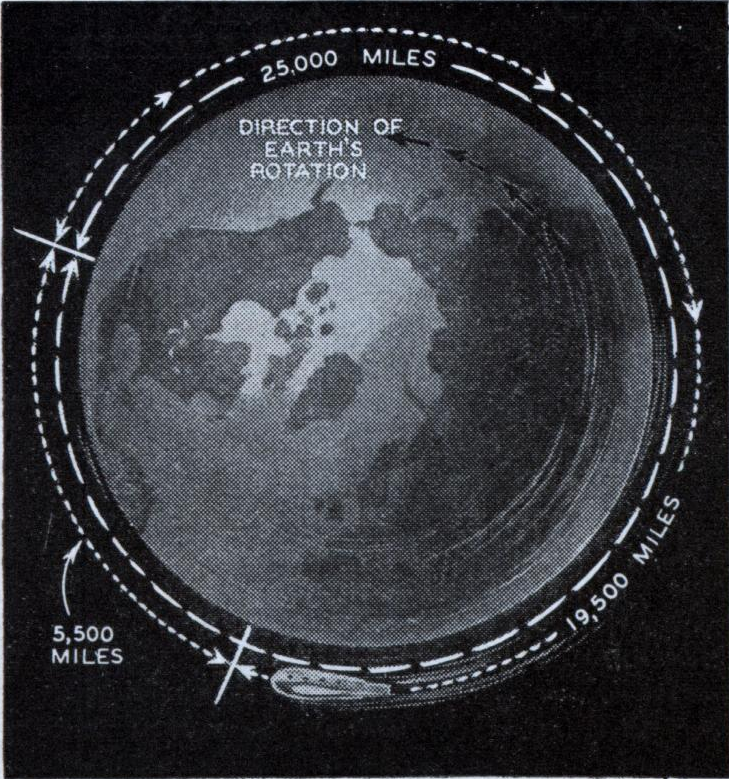 “…In rocket-propelled machines… it will be practicable to attain speeds of nearly a mile a second (3600 m.p.h.) through the rarefied medium above the stratosphere. Nikola Tesla, electrical wizard, foresees the day when airplanes will be operated by radio-transmitted power supplied by ground stations, as shown in the drawing above. The world will soon enjoy the benefits of electricity transmitted by radio. Huge and expensive transmission lines will be unnecessary. Bulky and unsightly distribution systems will be done away with. A little receiving device in your home will give you all the power you can use — and for only a fraction of present-day costs. We will soon be communicating with other planets, where it is entirely possible that there is civilization far ahead of ours. Tomorrow we will see rocket planes flying through stratosphere at a speed of a mile a second or 3000 miles an hour. Fanciful dreams? No! Just conclusions based upon knowledge of what has been done, what is being done and what can be done in the future. I speak along practical lines and with a practical knowledge of what I am talking about. Power transmission by radio is going to change our present civilization materially. The transmission of energy to another planet is now only a matter of engineering. I have solved the problem so well I no longer regard it as doubtful. I am also certain there are creatures on other planets whose ways are like ours. The new era will see amazing developments in interplanetary relations. Every other planet has to pass through the same phase of existence this earth did, and life is started on them during that favorable phase by the rays of some sun. It develops in the presence of moisture, heat and light in much the same manner as life does here. We know that light propagates in straight lines, and consequently our perceptions of the forms through the images projected on the retina must be true. Therefore, it should not be hard to establish intelligent exchange of ideas between two planets. The earth we inhabit might be the beneficiary. It is conceivable that there is civilization on other planets far ahead of ours. If communication could be established by the earth the benefits to human beings would he incalculable. Radio Pioneer Nikola Tesla was born in Hungary, came to the United States in 1884 and has since developed more than 100 devices and improvements in electrical technology. 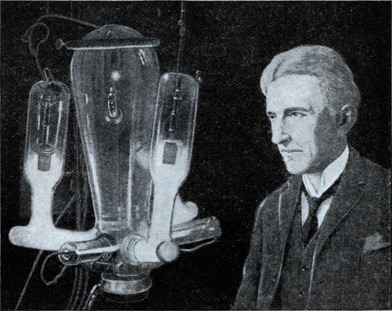 Once associated with the late Thomas A. Edison, Tesla sent a radio impulse around the world almost 40 years ago. He discovered the rotating field principle in alternating currents and is considered one of the greatest living electrical scientists and radio authorities. As far back as June, 1900. in discussing my experiments at the beginning of the century, I said that my measurements and calculations showed that it was perfectly practicable to produce on our globe an electrical movement of such magnitude that, without the slightest doubt, its effect would be perceptible on some of our nearer planets. as Venus and Mars. Thus, from mere possibility, interplanetary communication has entered the stage of probability. In fact, that we can produce a distinct effect on one of these planets in this novel manner, namely, by disturbing the electrical condition of the earth, is beyond any doubt. In order to make myself clearer I shall delve still further into lite preliminary discoveries made in what I call my pioneering days, which was long before any other scientist had made any progress in this field. I have always chosen to remain in the background. Some years ago I urged the experts engaged in the commercial application of the wireless art to employ very short waves, but for a long time my suggestions were not heeded. Eventually, though, this was done, and gradually the wave lengths were reduced to but a few meters. 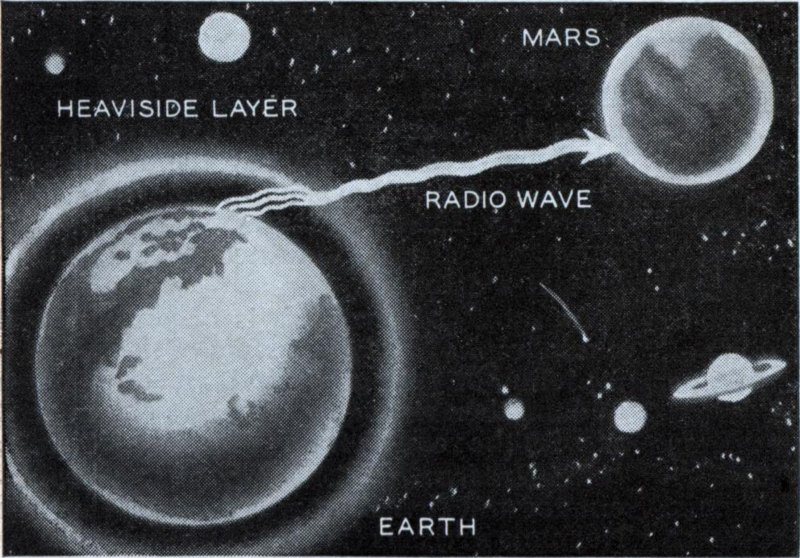 Invariably it was found that these waves, just as those in the air, follow the curvature of the earth and bend around obstacles, a peculiarity exhibited to a much lesser degree by transverse vibrations in a solid. Recently, however, ultra-short waves have been experimented with and the fact that they also have that same property was hailed as a great discovery, offering the stupendous promise of making wireless transmission infinitely simpler and cheaper. It is of interest to know what wireless experts have expected, knowing that waves a few meters long are transmitted clear to the antipodes. Is there any reason that they should behave radically different when their length is reduced to about half of one meter? As the knowledge of this subject seems very limited, I may state that even waves only one or two millimeters long, which I produced thirty-four years ago, provided that they carry sufficient energy, can be transmitted around the globe. This is not so much due to refraction and reflection as to the properties of a gaseous medium and certain peculiar action. The chief object of employing very short waves is to provide in increased number of channels required to satisfy the ever-growing demand for radio appliances. But this is only because the transmitting and receiving apparatus, as generally employed, is ill-conceived and not well adapted for selection. Because of this and other shortcomings, I do not attach much importance to the employment of waves which are now being experimented with. Besides, I am contemplating the use of another principle which I have discovered and which is almost unlimited in the number of channels and in the energy three-electrode tubes. This invention has been credited to others, but as a matter of fact if was brought out by me in 1892, the principle being transmitted. It should enable us to obtain many important results heretofore considered impossible. With the knowledge of the facts before me, I do not think it hazardous to predict that we will be enabled to illuminate the whole sky at night and that eventually we will flash power in virtually unlimited amounts to planets. I would not be surprised at all if an experiment to transmit thousands of horsepower to the moon by this new method were made in a few years from now. We must establish transmission of power in all its innumerable applications. This has been my life work, and although I am now close to 78, I unhesitatingly say that I hope to see its fruition. I have been fortunate in the evolution of new ideas, and the thought that a number of them will be remembered by posterity makes me happy indeed. I am confident that my rotating field and induction motor and the wireless system I have given to the world will live long after I have gone. “The scientists from Franklin to Morse were clear thinkers and did not produce erroneous theories. The scientists of today think deeply instead of clearly. One must be sane to think clearly, but one can think deeply and be quite insane. You ask me about atomic energy? I experimented with the atom, and achieved similar ends, long before the wave of ballyhoo swept over the country in recent years. The idea of atomic energy is illusionary but it has taken a powerful hold on the mind and there are still some who believe it be be realizable. I have disintegrated atoms in my experiments with a high potential vacuum tube I brought out in 1896 which I consider one of my best inventions. I have operated it with pressures ranging from 4,000,000 to 18,000,000 volts. 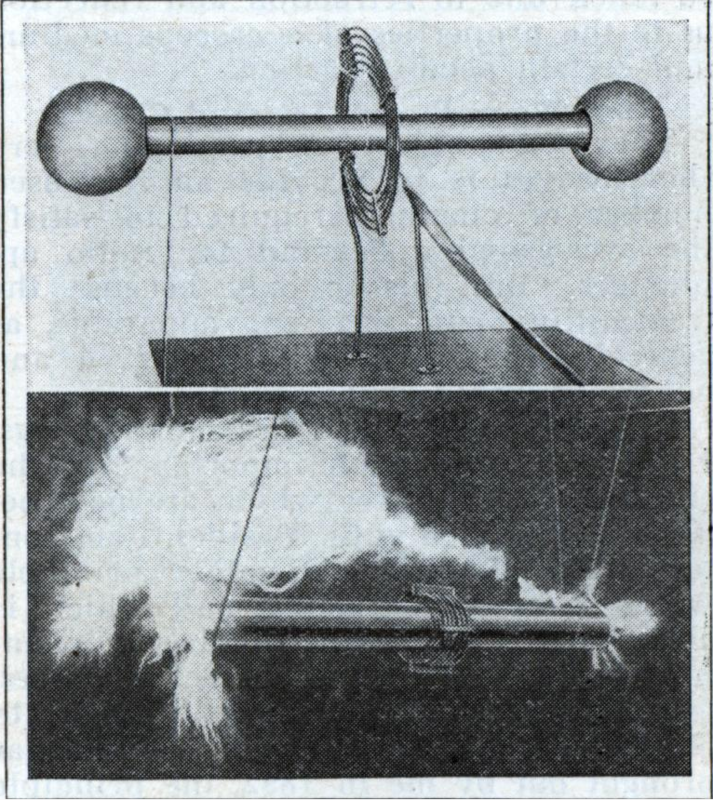 More recently I have designed an apparatus for 50,000,000 volts which should produce many results of great scientific importance. But as to atomic energy, my experimental observations have shown that the process of disintegration is not accompanied by a liberation of such energy as might be expected from the present theories. And as for the cosmic ray: I called attention to this radiation while investigating Roentgen rays and radioactivity. In 1899 I erected a broadcasting plant at Colorado Springs, the first and only wireless plant in existence at that time, and there confirmed my theory by actual observation. My findings are in disagreement with the theories more recently advanced. I have satisfied myself that the rays are not generated by the formation of new matter in space, a process which would be like water running up hill. According to my observations, they come from all the suns of the universe and in such abundance that the part contributed by our own sun is very insignificant by percentage. Some of these rays are of such terrific power that they can traverse through thousands of miles of solid matter. They have, furthermore, other extraordinary properties. This ray, which I call the primary solar ray, gives rise to a secondary radiation by impact against the air and the cosmic dust scattered through space. It is now commonly called the cosmic ray, and comes, of course, equally from all directions in space. If radium could be screened effectively against this ray it would cease to be radioactive. I work every hour that I am awake but not with a feverish tempo. Although I live in the midst of the hustle and bustle of New York, I do not time my scientific experiments to the hectic, jazz rhythm of the hysterical metropolis. I work for the future — build for the future. Just as today I see the realization of experiments carried on fifty years ago, l am now working with a view toward still greater achievements which will come to pass a half century hence. That is my method. After experiencing a desire to invent a certain thing, I go on for days, months, even years with the idea in the back of my head. Whenever I feel like it, I play around with the problem without giving it any deliberate consideration. This is the incubation period. Future rocket planes may circle the globe in 5 1/2 hours. At 3600 m.p.h., the plane travels about 19,500 miles. 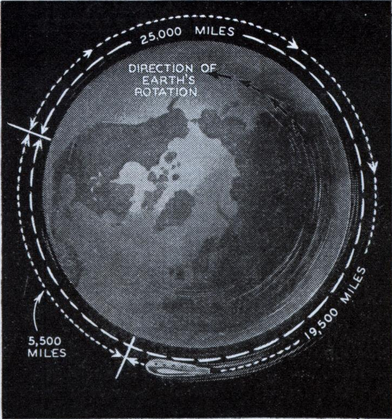 Earth's rotation adds 5500 miles to total. Next comes the stage of direct effort. At this point the solution is somewhere in my subconscious mind, although it may take some time before it reaches the level of consciousness. As my conceived device begins to take form, I make mental changes in the construction, improvements are figured out, and I even operate it. All of this is preliminary work — all in my mind. When the machine itself is finished, I slip my imaginary job over it and find they coincide to the minutest detail. A great development can be expected in rocket propelled machines for purposes of peace and war. With such machines it will be practicable to attain speeds of nearly a mile a second (3600 miles per hour), through the rarefied medium above the stratosphere. I anticipate that such machines will be of tremendous importance in international conflicts of the future. I foresee that in times not too distant, wars between various countries will be carried on without a single combatant passing over the border. At this very time it is possible to construct infernal machines which will carry any desired quantity of poison gases and explosives, launch them against a target thousands of miles away and destroy a whole city or community. If wars are not done away with, we are bound to come eventually to this kind of warfare, because it is the most economical means of inflicting injury and striking terror in the hearts of the enemy that has ever been imagined. My paramount desire today, which guides me in everything I do, is an ambition to harness the forces of nature for the service of mankind. As I see it, we are on the threshold of a gigantic revolution based on the commercialization of the wireless transmission of power. The principles for this have been discovered by me. As this wireless energy is converted into a commodity for the use of the masses, transport and transmission will be subjected to tremendous changes. Motion pictures will be flashed across limitless spaces by my system. 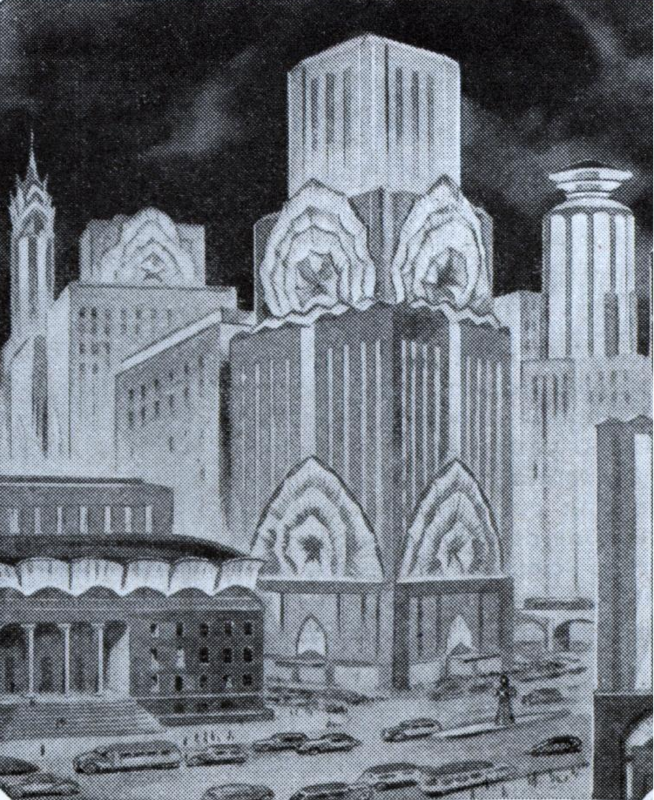 The same energy will drive airplanes and dirigibles from one central base. In this new era man will be able to travel safely, and at great speed, to any part of the world — the jungle — the arctic — the desert — mountain tops — over oceans. The instruments by which these wonders will be achieved will be amazingly simple. These things will come to pass. Some of them are already within the realm of realization. But like those wonders which I predicted and helped perfect nearly fifty years ago — in the early 80′s — power transmission is just around the corner. It’s coming.